1. Clean your hands, kitchen and dining surfaces regularly, and before handling food. 2. 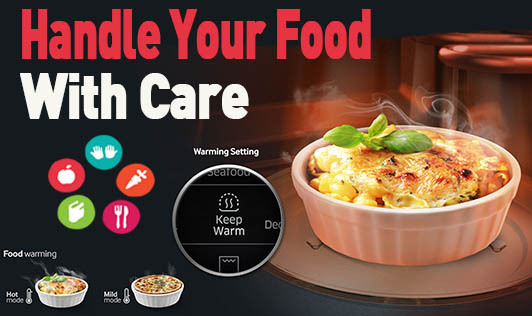 Cook foods to proper temperatures to avoid bacterial contamination. 3. Refrigerate and re-heat appropriately to prevent spoilage. * Choose fresh produce from the market. Transfer the fresh veggies and fruits to the refrigerator as quickly as possible. * Cook vegetables till crispy tender. Do not overcook. * Cut, clean and cook non-veg foods and other foods separately to avoid cross contamination. Meats, fish, eggs get more easily contaminated by micro-organisms than others. * Eat hot or warm cooked food. Do not keep cooked food at room temperatures for long periods of time (more than 2 hours). * If you need to eat cold foods like dessert or salad or cold soup, eat it fresh; not stale. * Use cooked leftovers within 3 days of refrigeration.